Welcome to the TennisKids Rainbow! Your kids always have a great time on our TennisKids courts at school! Having fun is always the most important thing. However, I’m sure you’d like to know what they’re learning with us too! 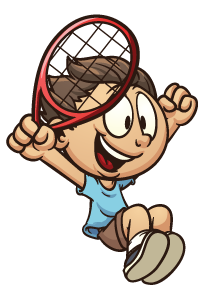 The TennisKids Rainbow is our evaluation tool that we use to assess each one of our kids. It is designed to measure their individual progress twice per session (at the halfway point and at the end of each session). The progress levels are represented by color-coded tennis grips, similar to Karate. Your kids will receive a certificate along with a real grip to place on their own tennis racquet! With the TennisKids Rainbow, tennis just got a whole lot more fun!